The tools can be purchased individually for $25.00 or free of charge with any corresponding consulting service. They work well together or individually. They are also described in detail in the Strategies section of this site. Develop an organizational competency with trust. Communication is the mechanism businesses employ to sustain trust with the two audiences that determine success: employees and customers. Managers in all functional areas must master the principles of trust-based leadership and communicate in a manner that conveys integrity and engenders loyalty. 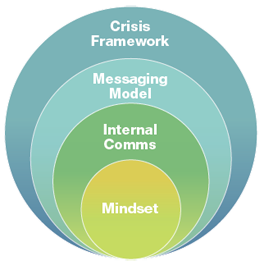 No department is better positioned to serve the organization in this capacity than Internal Communications. Develop a communications strategy based on how your customers will experience a change. Based on customers’ mindsets, this 4-step process establishes communications goals and strategies to support an optimal customer experience. The process is rooted in an understanding of customers’ desires and fears and therefore builds trust and confidence by delivering messages that anticipate and address customers’ needs. When applied correctly, this process has been proven to streamline internal communications activities while improving brand quality through unified messaging that spans silos and geographic constraints. Align corporate citizenship with crisis management. In contrast to traditional crisis response, which is defined largely by financial and legal liability, crisis management in the era of massive environmental, terrorism-based, and economic crises is based on the concept of corporate citizenship. Essentially, customers expect businesses to assume greater responsibility during a crisis and to exhibit a broader set of leadership principles based on care and concern for the community at large. Note: These tools can be purchased individually or free of charge with any corresponding consulting service.